There are lots of ways you can use volleyball banners. You can hang up volleyball try-out banners to let people know when and where to try out for the team. Once you have your team, you can put up a banner with a picture of your volleyball team and your schedule. 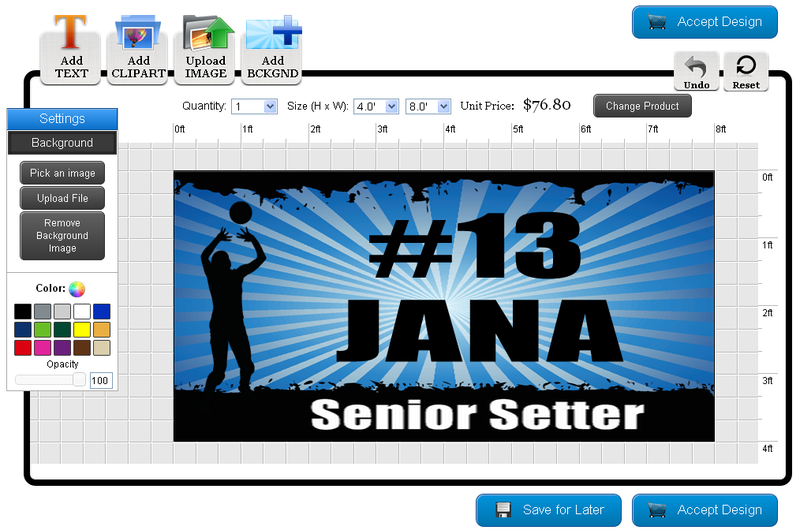 You can also do individual volleyball player banners with a picture, their position and some stats. 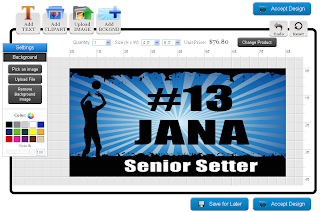 At Banners.com it's easy to get a custom volleyball banner. 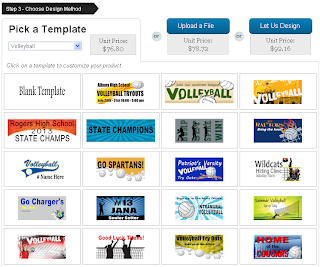 We have volleyball banner templates available to customize. To get started, go to our volleyball banners page. The standard finishing for vinyl banners is heat welded hems and grommets every 2-4 feet around the perimeter. Reinforced hems, reinforced corners and pole pockets are also available. We don't recommend using reinforcements for indoor banners. There are three different ways you can order volleyball banners. You can pick a template, upload a file or work with a graphic designer. We will show you how to order by selecting a template. When you find a template that you want to customize, put your mouse over the template and click on the "Customize Template" button. This will take you into the online designer. All of the templates are fully customizable. 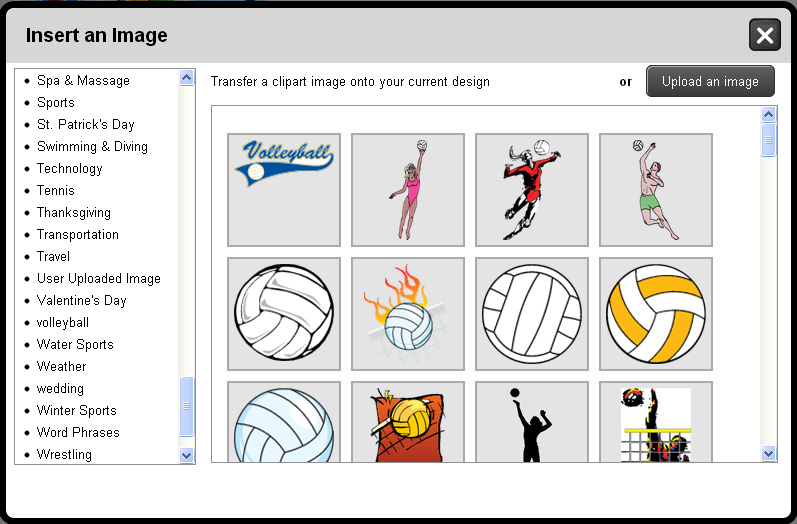 We have volleyball clip art available for you to use. Click on the "Add CLIPART" button. This will open up a pop up of all of our clip art. Scroll down until you see the "volleyball" category and click on it to view the images. Click on an image to add it to your design. We have some volleyball backgrounds and other sports backgrounds available for you to use. Click on the "Add BCKGND" button. This will open up a pop up of all of our backgrounds. Scroll down until you see the "Sports Background" or "Volleyball Backgrounds" category. Click on a category to view all of the background images. You can also browse our other categories. Click on a background and click the "Insert Background" button to add it to your design. 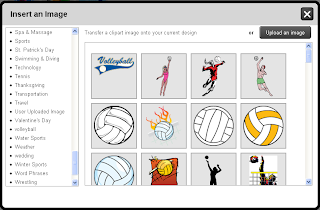 If you want to add a photograph of a volleyball player or the volleyball team, click on the "Upload IMAGE" button. A pop up window will appear. Click on the "Select Files" button and upload the files from your computer. The image will appear in the online designer. Go to our volleyball banner page to get started on your banner.